Three burglars decide to rob a blind man who has a large sum of money stacked in the safe in his house- money he got as settlement when his daughter got killed in an accident. The blind man lives in an isolated neighbourhood and lives alone, so the task of robbing him seems to be easy. But the blind man is an army veteran and he has a ferocious dog, so for the first time one of the burglars carries a gun with him, even though they have no experience or intentions to use it. The other two burglars do not know of the gun at all and are shocked by seeing it later. One of the burglars is a girl (played by Jane Levy) and she is pretty with blond hair. One wonders why such a pretty girl would get mixed up with this kind of crime but as she explains she has had a tough childhood in which her mother used to keep her locked up in the trunk of a car and even now practically neglects her. The burglar girl dreams of moving to California with her cute little sister and her motive for the burglary is that the money would help her achieve her dreams. One of the two males burglars is also a cute kid who is initially reluctant to join and scrams off for a while on seeing the gun before deciding to come back . As the three give the dog some spiked food to eat which puts it to sleep for a while, they enter the house. But the blind man does not turn unconscious by the gas they propel into his room and that is where things turn wrong. The blind man has a gun too and being an army veteran he is more prepared to use it. On the other hand the burglars do not have guts to use their gun and this turns things really awry for them. The blind man has far more physical strength than the three and he is far more vicious than they think. He is able to fire his gun accurately in the direction of sound and the sound of heavy breathing (which the terrified burglars are likely to make in their fright) is where he will fire. 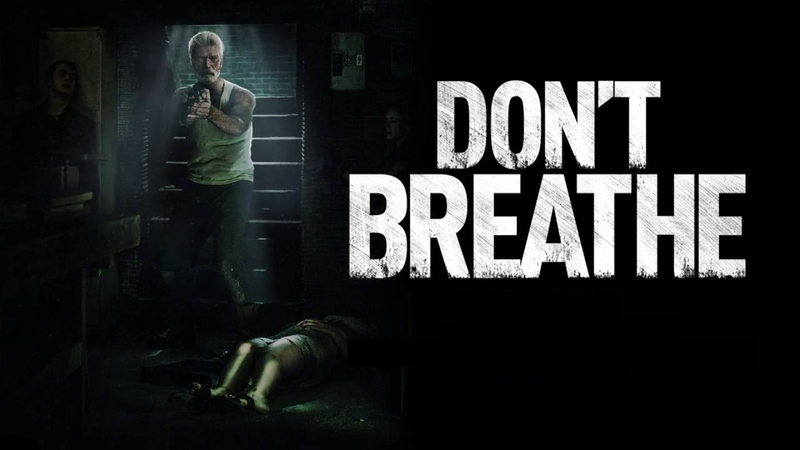 So the key word for the burglars is ‘don’t breathe’ while being confronted by the blind man, which fully justifies the title of the movie. As the burglars cannot escape from the house, they go deep inside it and that is their mistake- for they stumble upon the blind man’s dark secret and that really sets him on finishing them off. So what is the secret that the man is hiding? Will any of them escape from the situation alive? As the man switches off the lights of the house, the movie is in darkness; another element is the dog who is ferocious when he finally wakes up and has a serious impact on the proceedings. The movie moves forward in the dark rooms and underground corridors of the house and later outside in the surrounding streets and keeps you tensed all along. The movie is more thriller than horror, though some jolts in the movie remind you of horror movies especially because they are in the typical setting of horror movies- in a darkened house . Photography and sound effects are appropriate for the situations and the acting is in capable hands. The triumph of the director is in making the criminals look like victims once inside the house and making you sympathise with them; I was really hoping that the three would escape from the house and escape with the money they came to loot!! So do they? Watch the movie for that.